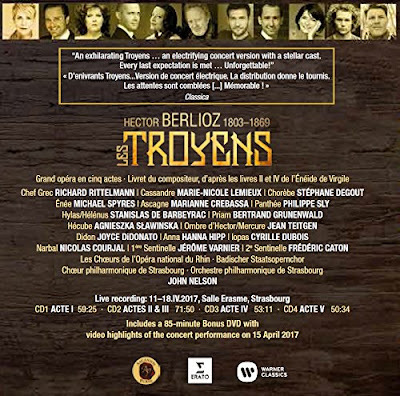 British performing groups and Anglo-phone singers have played an important role in the history of Berlioz' Les Troyens from the Glasgow Grand Opera staging in the 1930s conducted by Erik Chisholm, to Sir Thomas Beecham's post-war concert performance (available on disc), the landmark 1950s production at Covent Garden (available on disc), Colin Davis' account of the opera at Covent Garden and on disc for Philips (along with a new critical edition of the opera), and Davis' own second go with the London Symphony Orchestra (available on disc), not to mention John Eliot Gardiner and the Orchestra Revolutionnaire et Romantique's performances at the Chatelet Theatre in Paris in the centenary year with an Italian Cassandre and American Didon and Enée (available on DVD). The Parisian tradition of performing the work does not seem to have translated into an important post-war recording tradition, and one of the great post-war Didon and Cassandres, Regine Crespin's recording is regrettably only excerpts. All this means that French as she is sung by native speakers has not been terribly important to Les Troyens on disc. 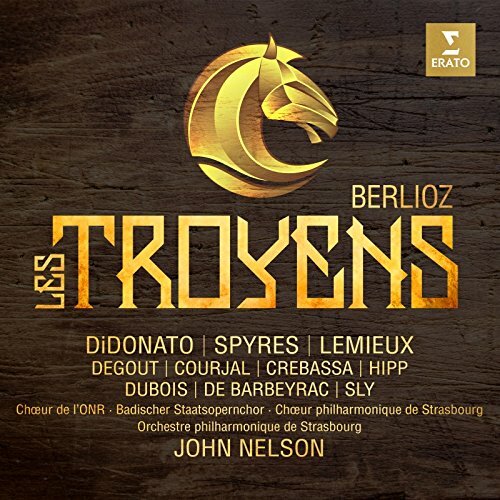 At first sight, this new recording of Les Troyens from Erato is no different, with its American conductor, John Nelson [see my interview with John Nelson], American Didon & Enée, and Canadian Cassandre, especially as this uses a modern instrument orchestra (as compared to John Eliot Gardiner's recording using the original saxhorns for the brass instruments). But there are different layers of authenticity. At least a dozen of the 16 soloists on this new set are Francophone (that Canadian mentioned above is Marie-Nicole Lemieux who is French Canadian). 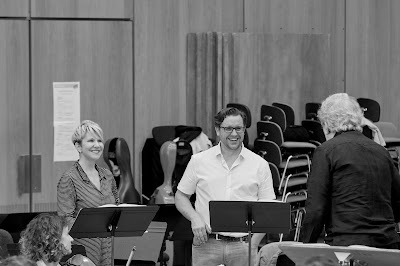 And both Joyce DiDonato and Michael Spyres (the Didon & Enée) have extensive experience in singing 19th century French opera, and are supreme stylists in this repertoire. This feeds into another aspect to the recording, it might be modern instrument but John Nelson's whole approach reflects Berlioz' place in the tradition of early to mid-19th century French opera. This is the least post-Wagnerian of accounts of the opera. 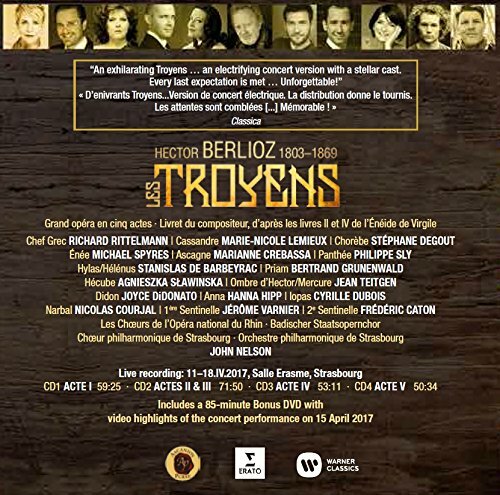 Les Troyens might never have been performed at the Paris opera, but its whole construction and the forces used (four bassoons, six harps, eight horns, nine trombones, six tubas) reflects those available at the Paris Opera, not to mention the libretto's reflection of French Grand Opera, albeit through Berlioz' quirky genius, and the roles of Didon & Enée are in the tradition of those written for Cornélie Falcon and Gilbert Duprez (who sang the title role in Berlioz' Benvenuto Cellini in its abortive Paris Opera performances). The French slant to the recording is obviously important to conductor John Nelson, his booklet note explicitly mentions the 'mostly French cast, a French orchestra and two French choirs' along with a chorus from Karlsruhe where the opera was first performed complete. (see my interview with John Nelson). In other respects, this is a very traditional version of the opera, no Sinon scene and Berlioz' revised, compressed ending. The results are very good indeed, and the recording (made at two concerts plus subsequent patch sessions) has a great combination of immediacy and clarity. John Nelson's account of the opera is fluid and pacey, with a nice control of the large scale architecture along with a fine eye (or ear) for telling detail. When Nelson hurries the pace and notes seem to tumble over each other in sections such as the conclusion to Act Two scene One, we never lose clarity or control. When it comes to Joyce DiDonato and Michael Spyres, the word that immediately springs to mind is 'souplesse' (flexibility, suppleness). 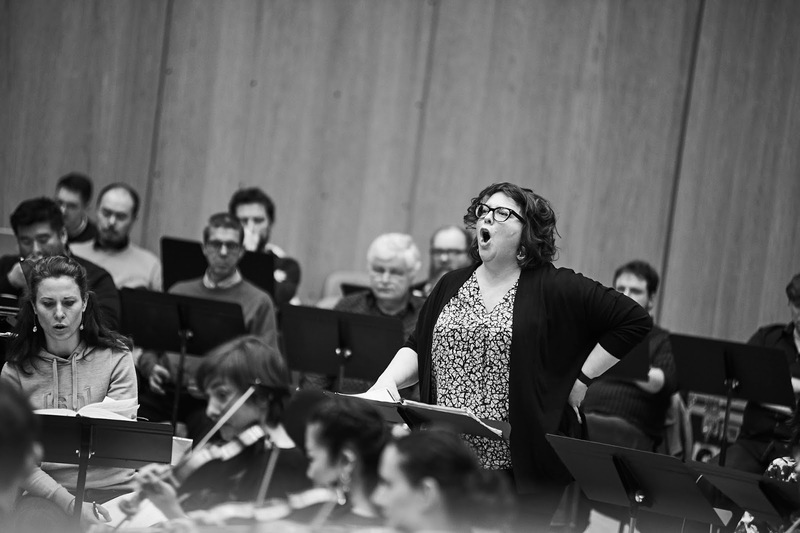 DiDonato's Didon moves from the commanding to the emotionally wrought whilst Spyres' Enée is lithe and heroic. But it is the suppleness of their line which I came to enjoy, just listen to the beautifully shaped love duet which concludes Act Four. Joyce DiDonato is fabulous in the way she conveys Didon's welter of emotions, moving from whiplash command to emotional wreck on the turn of a pin, but always within the classicism of Berlioz' writing. Parts of the role might take her to her limits, but she never makes the line bulge or explode, the emotion is writing the music and the ending is heartrending. Michael Spyres is similarly stylish and he uses his strong technique in a way dramatic tenors in post-Wagnerian accounts of the role are simply unable to do. This is an Enée who conquers not through sheer force but with intelligence and artistry. (In this context, Spyres' recent recital of French music for Opera Rara is extremely illuminating of the music styles out of which Berlioz' Enée arises, see my review). So that 'Inutiles regrets' has a slow build effect which reaches a powerful and moving climax in the subsequent 'Debout, Troyens' scene. Marie-Nicole Lemieux is an equally powerful yet very different Cassandre. The end of Act Two is incendiary, and I loved the way she makes Cassandre really snarl at the Greeks. Yet Act One is powerfully moving, ranging from the touching duet with Stéphane Degout's Chorèbe to the powerful climax as Cassandre forsees doom even as the Trojans bring the horse into Troy. 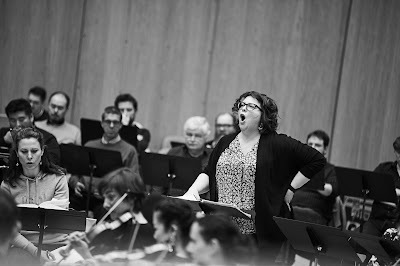 Marie-Nicole Lemieux's duet in Act One with Stéphane Degout displays another of the recording's strengths, the depth of the casting. Stéphane Degout makes a quietly elegant Chorèbe with the duet moving towards desperation without bluster, and both singers reflecting the power of the French language. Hanna Hipp makes an attractively dark toned Anna, partnering Joyce DiDonato in a touching account of their Act Three duet and forming a definite contrasting foil for Nicolas Courjal's Narbal, Whilst I appreciated Courjal's artistry, dark-tinged voice and characterful performance as Narbal, his voice's vibrato lent a little too much instability to the line for my taste. The two tenors make a fine contrast to the tradition of English lyric tenors in the roles of Iopas and Hylas. Cyrille Dubois as Iopas sings with finely focussed tone and great style, in a really spine-tingling account of this solo. Stanislas de Barbeyrac is equally fine, in a vibrantly characterful yet lyrical account of Hylas' Act Five solo. Later in that act Jérôme Varnier and Frédéric Caton manage to be both stylish and characterful in the sentinels' duet both singing with distinctly French timbre. The other smaller roles are finely taken, Marianne Crebassa's bright voiced Ascagne, Jean Teitgen's powerful Mercure (thankfully without extraneous electronic effects) and Philippe Sly's noble Panthée. The small roles of the Ghosts are well taken and wonderfully complemented by Nelson's ear for the striking sonorities in Berlioz's orchestration. 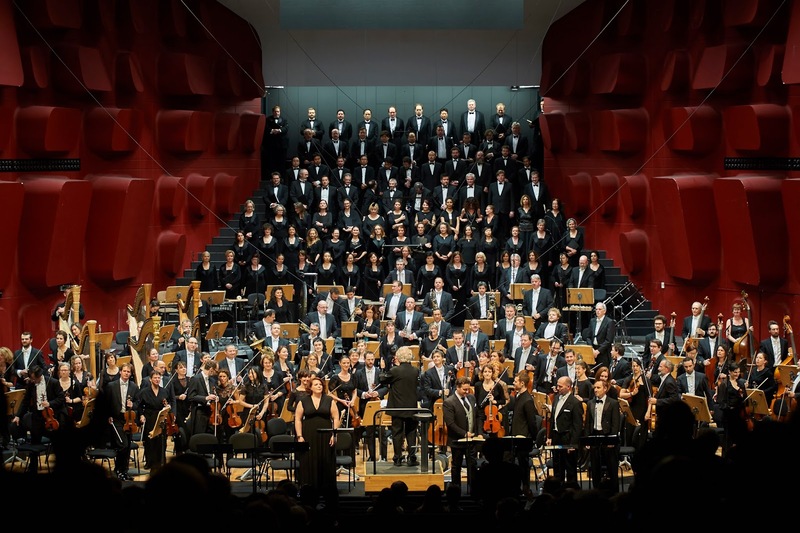 Both the choir and the orchestra are on terrific form, and the orchestra gives finely judged accounts of the many orchestral moments in the opera. The overall sound is lithe, as is appropriate to the recording. The set, over four CDs also includes a DVD with highlights of the concert performance. I regret immensely that I was not in Strasbourg on 15 or 17 April 2017 to catch one of these performances live, but this set is far more than simply a worthy transcription of an occasion. It is a disc which attempts to give us an account of Berlioz's opera which reflect the style of mid-19th century French opera, but at its core there are three coruscating performances from Michael Spyres, Marie-Nicole Lemieux and Joyce DiDonato. This terrific recording can rightly stand alongside the great performances of the past and really does bring something different to the mix. 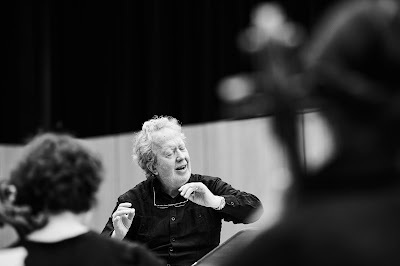 Read my interview with John Nelson, talking about his career and inspirations, and recording Les Troyens.